For subcutaneous vaccination of healthy dogs 6 weeks of age or older as an aid in the prevention of disease. Contains Parvovirus for rapid immunity and cross protection against all recognized field strains. High titer, low passage parvo fraction - High vaccine titers have been shown to overcome low-level maternal antibody interference in puppies. Corona for added peace-of-mind. Meets or exceeds all USDA Standards Convenient choice of IM or SC administration. Ideal first shot for puppies - No Lepto fractions. 1 dose syringe is sold in a case of 25. Open syringe by twisting or tapping the cap against a hard surface to break the heat weld. Prepare the vaccine by injecting the diluent into the vial containing the desiccated vaccine cake. Shake well. Withdraw entire contents into the syringe. Thoroughly prepare injection site with antiseptic. Lift the loose skin behind the neck or behind front leg and insert needle. Inject entire contents of syringe. Do not inject directly into blood vessel. Before injecting vaccine, pull back slightly on syringe plunger. If blood enters the syringe freely, choose another injection site. A recommended vaccination schedule should start at or about 6 weeks of age. The presence of maternal antibody is known to interfere with the development of active immunity. Puppies should be revaccinated every 2 to 3 weeks until at least 16 weeks of age. 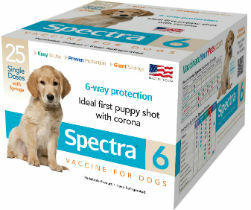 All dogs over 12 weeks of age should initially receive one dose of Spectra® 6 and a second dose 2 to 3 weeks later. Annual revaccination with a single dose is recommended.